One of my favorite cocktails blogs is by Jeffrey Morgenthaler, the bartender at Portland's Clyde Common who began a cocktail blog years ago before there were many such things. He has a particular knack for well made classic cocktails, as well as a healthy disdain for imposters (his takedown of a bad mint julep is classic). This amaretto sour is inspired by Morgenthaler's recipe for "the best amaretto sour in the world," which I made while reading Craft Cocktails at Home (author Kevin Liu has a sidebar interview with Morgenthaler in which they discuss the drink, among other things). 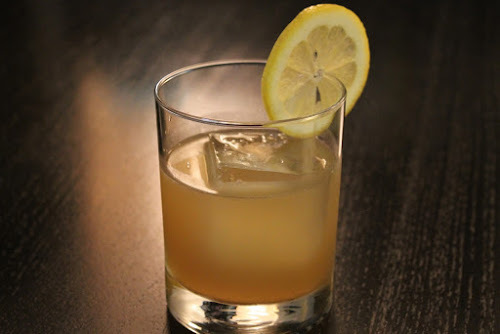 In the book, Morgenthaler says that Amaretto Sour is an easy drink; the trick is to use fresh ingredients (i.e. no sour mix). I made it without the egg white, since I didn't have any eggs at the time, and added maraschino liqueur, which Liu describes as having a slight smoky quality, which I thought would be interesting here. I also substituted lime juice for half the lemon juice to make it a little more sour. Combine ingredients in a shaker with ice. Shake until cold and strain into an old fashioned glass with ice. Garnish with lemon wheel. I remember you telling me about Morganthaler's takedown of the mint julip. Makes you appreciate how much thought, effort and creativity goes into making a good drink.